Enjoy spending time with our horses on our large riding ground which is about 10000 square meters in size. At the KHT riding square, we offer Horse Riding Lessons for children and adults, especially for the beginners. You can experience healing and impressive horse riding that you can experience nowhere else. Anyone is welcome. There are seldom chances like this. 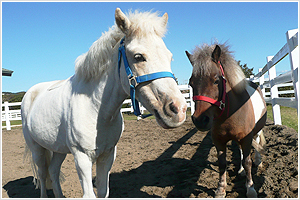 We offer a 540yen discount for the horse riding course for hotel guests!! 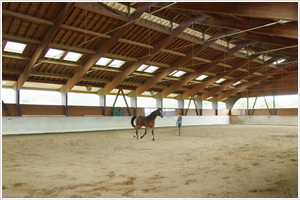 Beginner, Intermediate and Advanced courses are operated at the indoor riding ground. We ask customers who want to join any of our Beginner, Intermediate or Advanced courses how many times they have ridden horses. Riding after drinking alcohol is not permitted. Please note that according to the environmental conditions such as wind, thunder, bad weather and so on, the lesson may be canceled by the judgment of the instructor even if it is just before the lesson starts on the day. Free rental service is available for all the courses. 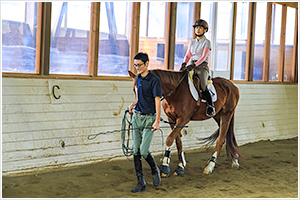 Children can ride on a pony and have a stroll inside the horse riding center accompanied by our instructor. Pony riding is available for 4 to 12 years old children. *Pony riding is available at anytime during trading hours. Please come and ask at the Horse Riding Center. Suitable for customers who will ride a horse for the first time. Suitable for the first time customers. 20 minute course. The reins will be attached to a horse for the instructor to guide. This is a basic course focused on walking. Have no experience, or have a few times of trekking experience overseas etc. Suitable for the customers who have experienced horse riding before. 30 minute course. 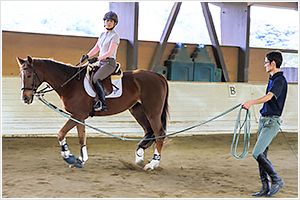 The reins will be attached to the horse for the instructor to guide. 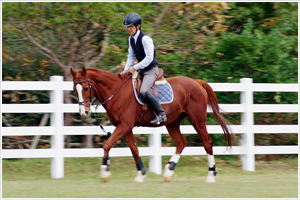 This is a horse riding course focused on trotting or posting trot. 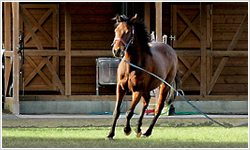 Lesson is for the customers who have had posting trot lessons more than 10 times. Have ridden horses more than 10 times. Limited only to the customers who have experience.45 minute individual lesson course. This is a course where the customers ride a horse individually based on our staff’s guide. For the customers who can canter the horse on their own (not in a group). Because the customer of this Advanced course is required to ride on his/her own, we ask about horse riding experience (number of times which the customer has ridden a horse) at the time of reservation. Have ridden horses more than 100 times. When you join a course, please collect your horse riding ticket at the hotel front desk. *As for pony riding, only this is offered every day. *Riding a horse wearing a skirt or sandals is very dangerous, please wear a pair of trousers, sneakers and socks. *To ensure the customers have enough time to get ready, please arrive 15 minutes beforehand. *Depending on seasons, operating hours at the horse riding center may vary. Please contact us for the details.